A casual dining area within Thomas Keller's Bouchon. : Bar Bouchon, part of Thomas Keller's Bouchon restaurant in Beverly Hills, offers a menu of soups, salads, sandwiches and classics like the quiche of the day, mussels with white wine and garlic, and charcuterie and cheese. Chicken liver mousse pairs with country bread; a traditional frisée salad with lardons is tossed in a pleasantly acidic vinaigrette and topped with a poached egg. Hanger steak is a possibility, too. Conclude your visit with a seasonal tart or Valrhona chocolate brownie. 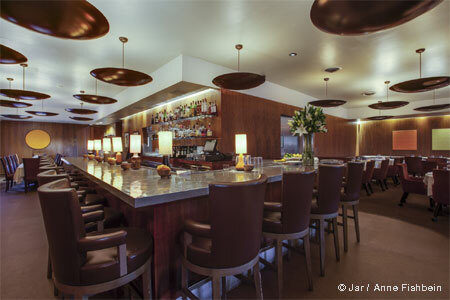 The wine list features about 30 labels poured by the glass, and truffled popcorn is served at happy hour. The setting is casual, with seating available at the bar or on the patio. 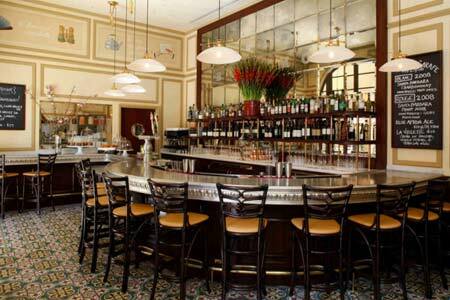 Note that no reservations are accepted for Bar Bouchon.